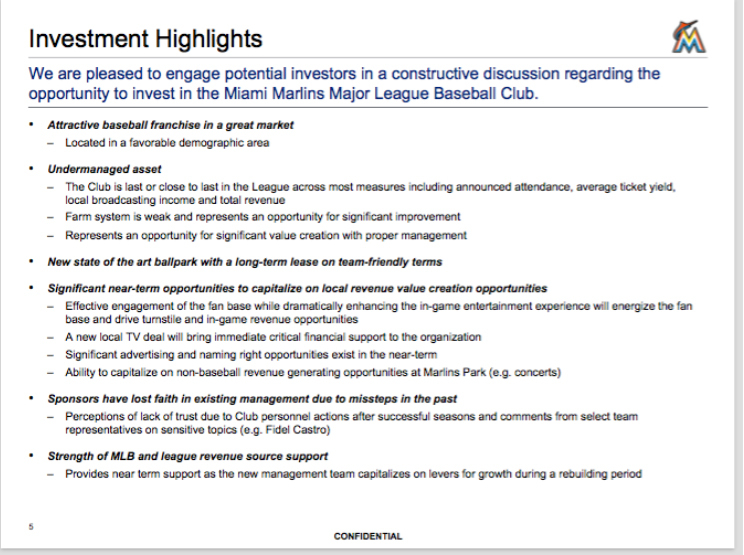 Every day the new owners of the Marlins are revealing added details about how they view their purchase as an investment --not a quest for championships. The latest revelation comes that lead investor Bruce Sherman is still seeking $250 million more from investors, as first reported by fanragsports.com. And it's all put in money terms, with "payroll discipline" being a top priority. What's clear is that Sherman has bought into the Marlins with the idea that sports teams tend to soar in value over time. If he just holds on to his investment, his money might double or quadruple in five or 10 years. 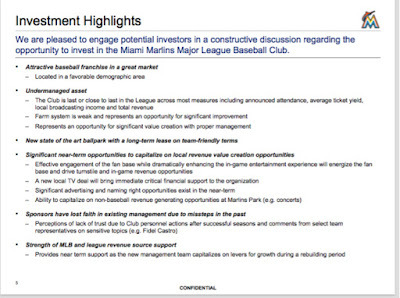 Consider Loria paid $158 million in 2002 and sold for $1.2 billion this year. Among Sherman's top priorities: "Payroll discipline." Investor talk for cutting salaries. Contrast that with Mark Walter buying the Dodgers in 2012 for $2.15 billion. The team president at their first meeting, according to Wall Street Journal, told the billionaire there two ways to build a winner -- high-priced free agents or developing young players. "Let's do both!" said Walter. With the Marlins all we hear is that Sherman has $400 million in debt that he has to pare down. Every move the owners have made so far seems focused on money, not victories. Heck, they even kept on Michael Hill, the guy responsible for innumerable bad drafts, trades and free-agent signings -- perhaps because he has a lengthy contract that they'd have to pay off to dump him. 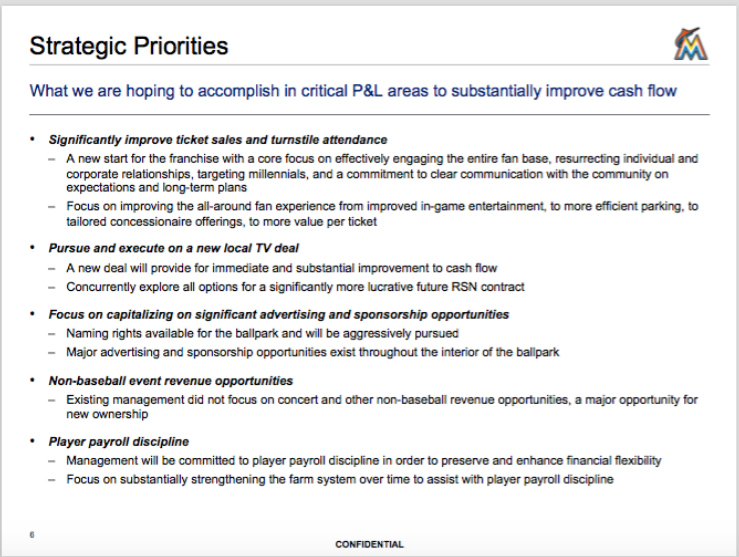 And still, the pitch to new investors starts with the promise that Sherman-Jeter will "significantly improve ticket sales." How? By dumping Stanton? Now, to be clear, Sherman inherited a mess from Loria. I'm sure Loria knew he planned to sell the team and was looking to get another championship -- without caring about long-term costs. 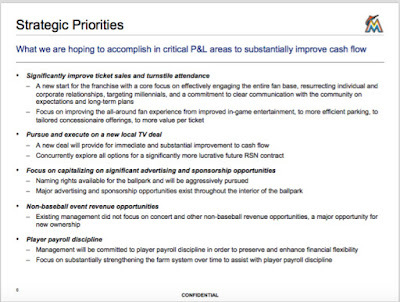 Stanton's ultra-long-term contract for $325 million -- back-loaded so that the team just starts to feel the hurt with the first big hit of $25 million in 2018 -- really never made sense for a team with poor attendance and awful TV contract. Then there's Chen -- due $12 million in 2018, and $20-plus million for the following two years. Tazawa gets $7 million next year, Ziegler $9 million, Prado and Volquez $13 million each. Marlins fans needed a deep-pocket owner, semi-insane, willing to spend big bucks for a championship -- and instead we got bean-counters just biding their time till the value of the club goes up.